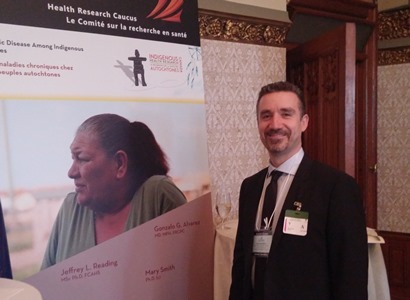 Dr. Gonzalo Alvarez was on Parliament Hill today presenting the Taima TB research program to the Parliamentary Health Research Caucus on Indigenous Health Research in Canada. Despite the ongoing efforts of dedicated public health programs, tuberculosis (TB) incidence in Nunavut was 119.2/100,000 people in 2015, which is 26 times the overall Canadian rate. This is comparable to high TB burden countries like Kenya and Thailand. Taima TB is a group of research projects aimed at helping Inuit in Canada stop the transmission of TB in their communities. Taima translates to ‘stop’ in Inuktut. Partners include The Ottawa Hospital (affiliated with the University of Ottawa), Nunavut Tunngavik Inc., the Government of Nunavut and Inuit Tapiirit Kanatami. Taima TB is led by Dr. Gonzalo Alvarez and funded by the Government of Canada (Public Health Agency of Canada) and other organizations. The Taima TB research group is working with remote circumpolar Inuit communities with high burdens of TB disease to package these strategies to into an innovative program aimed at the elimination of TB among Inuit.